At this time of year in the spring and early summer, the island is enhanced by the sound of the aptly named warblers, many of which have wintered far to the south of us in Africa. The most widespread of these species on Arran is the Willow Warbler. The appropriately named Blackcap and Whitethroat are also familiar. As the foliage increases in woods and hedgerows one of the most reliable ways of identifying warblers is by their unique song. Another of these warblers is the Garden Warbler. It is a common and widespread small bird that breeds in most of Europe and in western Asia including Arran. Despite its name, it is not really a garden bird, except in mature gardens next to woods. It prefers scrub, young woodland and woodland edge. It is a long range migrant wintering in Africa. A wide range of habitats are used in Africa, but closed forest and treeless Sahel are both shunned. Insects are the main food in the breeding season, although fruit predominates when birds are fattening prior to migration. These warblers have a mixed diet of insects and fruit in their African wintering grounds. The Garden Warbler is a very plain warbler with no distinguishing features. This is almost a feature! It is long-winged and long-tailed with brown upperparts and dull white underparts. The sexes are similar and juveniles resemble the adults. Due to its lack of distinguishing features, this species can be confused with a number of other unstreaked warblers. 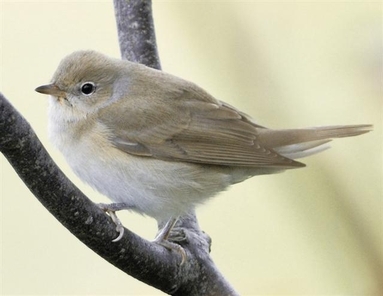 To further add to the challenge of identifying Garden Warbler, its rich melodic song is similar to that of the Blackcap, its closest relative, which competes with it for territory when nesting in the same woodland. Both the Garden Warbler and Blackcap songs are very melodic and quite beautiful. The Garden Warbler song, although confusingly similar to the Blackcap, lacks some of the separate phrases of Blackcap, is less varied and lasts longer. It goes on and it is sometimes harshly called the garbled warbler. This link, the RSPB: Garden warbler http://www.rspb.org.uk/wildlife/birdguide/name/g/gardenwarbler/index.aspxhas an audio link to its song. Garden Warbler usually sings from a well concealed perch, which adds to the frustration of identifying the bird. No wonder it is one of Arran’s overlooked birds.